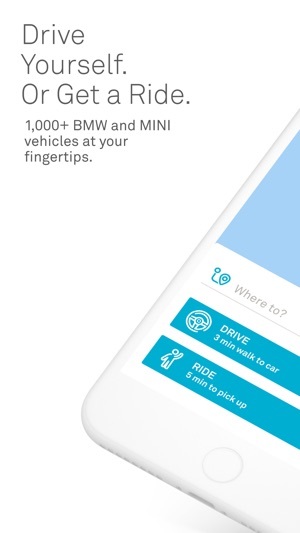 With ReachNow, choose whether to Drive yourself or get a Ride from one app and always in a BMW or a MINI. 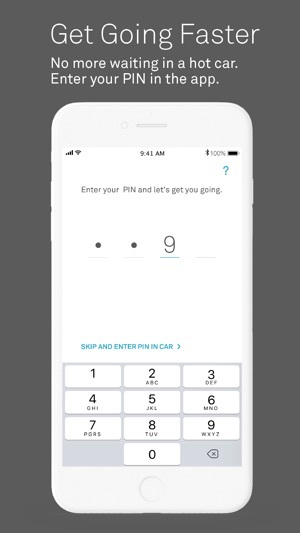 Now you can choose between car sharing, ride hailing and multi-day car rental without the hassle of checking multiple apps or log-ins. Just enter your destination and we’ll get you there. 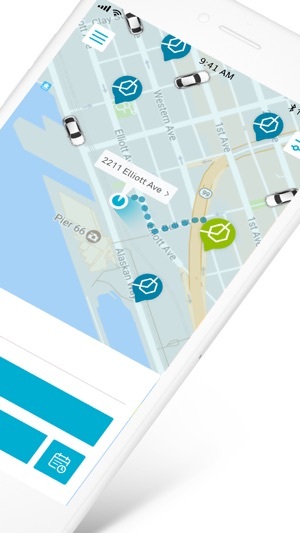 The full ReachNow experience is available in Seattle. Members in Portland can Drive themselves with our car sharing service. Sign up today for a one-time $15 fee and get a $15 credit. It’s free to sign up for Ride for a limited time. • Drive yourself: Grab one of the hundreds of BMW, BMW i and MINI vehicles available in your neighborhood. Reserve any car for up to 30 minutes free before your trip and only pay for the time you’re using the car. Our fleet features a mix of BMW 3 Series, BMW X1 SAV, electric BMW i3, MINI Clubman and MINI Cooper vehicles. • Avoid the rental counter: ReachNow is perfect for day trips or road trips. Our BMW and MINI fleet is sized for adventures of any kind. No need to visit a rental counter or return to a drop-off location. Just grab a car and go for up to 5 days. • Get a Ride: Request a Ride from one of our professional drivers when you don’t feel like doing the driving. No surge pricing. Personalize your ride with features, like “quiet time,” tune into your favorite radio station and set the temperature to enjoy every minute of your trip. • Plan it out: Perfect for when you know exactly when you need to be there. Schedule a ride from 20 minutes to 7 days in advance. Like having your private driver on demand. Fresh off the presses: We’re teaming up with moovel as part of the new BMW Group & Daimler joint venture. 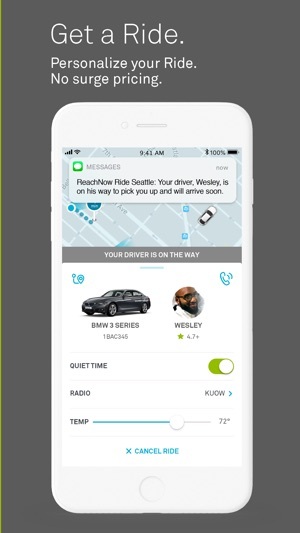 Learn more at www.reachnow.com. Great offering on paper, but the reality is that this app/service demanded active management to a degree that far outstripped its convenience. It has sent me on wild goose chases for cars I thought were reserved for me, blacked out for entire weekends, asked me to login and enter my payment info more times than I can remember and, to top it all off, has failed to lock my car when it says it has and charged me hundreds of dollars over what I’ve used. The end result has been me being late to work, me walking around in the rain trying to find another means of transportation on my phone, me waiting on call with customer service (often several times for the same problem), me having to change my long distance travel plans at the last minute, and me experiencing a simmering contempt every time I opened the app... which I’ve kept doing to this point for the promise of that rare experience where there’s an available car nearby that’s ACTUALLY AVAILABLE, that I reserve and activate smoothly, whose tires aren’t super under-inflated, that gets me where I’m going on or close to the schedule I expect, and that doesn’t continue charging me once I’ve parked it and ended my reservation. But alas, that experience has become a distant memory, so when the time came to enter my login and payment information (AGAIN), I found myself asking “what’s the point?” What’s the point indeed... so long, REACH NOW. 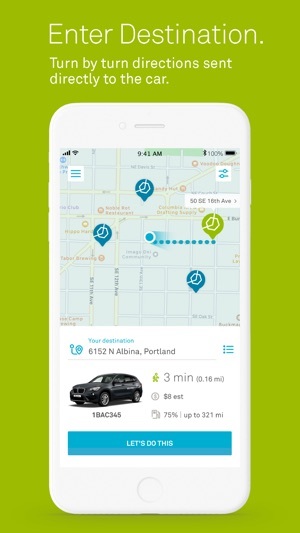 In researching our travel options for our trip, I came upon Reachnow loving the idea we could rent a car for a few minutes or few days and not have to commit to time we would not use. Once at our travel state and getting ready to look for a car, we were asked if we wanted the car or a driver so we went for the driver so we did not need to deal with directions and parking. The trips were much more affordable than Uber/Lyft, the drivers were right on time, friendly and helpful. There is no added tip, the company pays their drivers wages with incentives for quality service plus all the cars are BMW’s and clearly marked. We will not only use this service again but refer friends. The service is available in both Seattle and Oregon. We are super thankful we came upon Reachnow. Thank you for quality service 😃 see you on our next trip. That's awesome! I'm so glad ReachNow made traveling around Seattle easier and that you enjoyed the service. 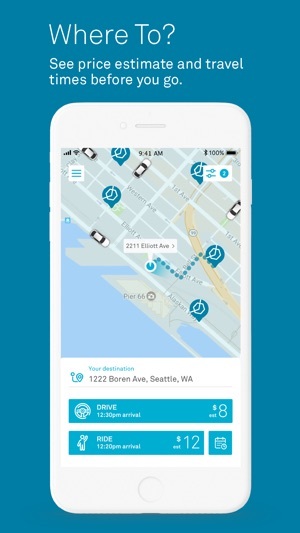 Overall I really enjoy ReachNow, in Seattle. Especially the simplicity of using the service and the support (probably the best I’ve ever experienced). I’ve been using this service quite a bit for over 3 months now. All the times I reached support it was an easy/quick conversation. Only had one misunderstanding with the support, but even, then they did their best to fix the issue within less than 24 hours. On some cars using the multimedia system may be cumbersome, since the bluetooth connection gets wiped out after each stop, and sometimes it takes multiple attempts to connect. But at the other end I feel safer knowing that my phone connection/contacts don’t get leaked to the next customer. Note: Using the member’s card will end the ride, unless you explicitly click the “Park and keep” option inside the car. This may be confusing when going out of coverage, since at that time you are automatically entered in park and keep mode. 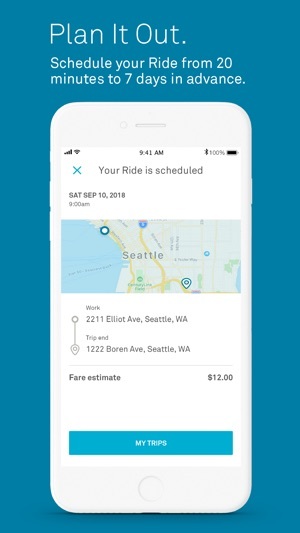 I will personally keep using this service in Seattle (at least), since it’s better pricing than its competitors, and its support is the best I’ve ever experienced.